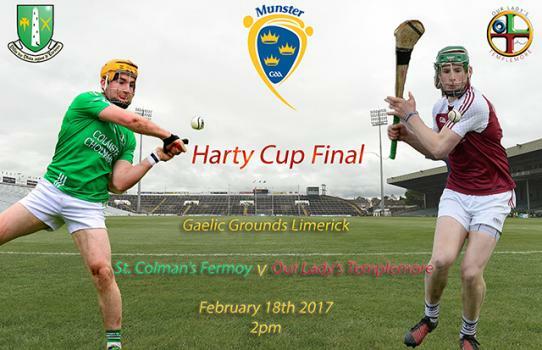 Live Streaming – Dr. Harty Cup Hurling Final – Our Lady’s Templemore v St Colman’s Fermoy – Match Preview February 17th, 2017 | NewsOur Lady’s Templemore will play St Colman’s Fermoy in the Dr. Harty Cup Hurling Final on Saturday February 18th at 2pm in the Gaelic Grounds Limerick.The game will be preceded by the Corn Thomais Mhic Cholim (18.5 B Hurling) Final between John the Baptist Hospital and Rice College Ennis at 12 noon.LIVE STREAMINGBoth Fin.. 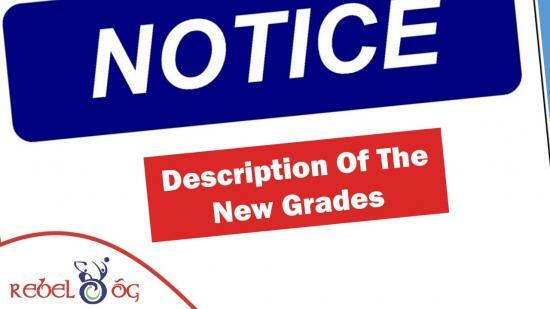 Following meetings between the the Gradings Committee and the Regional Committees the Grading Committee has now decided that all regional teams in the North, West, & East Regions will now be Graded A & B, as listed below.Grade A 15 aside For ( Teams Graded A in each Region)Grade B 1, 15 aside For ( Teams Graded B in each Region)Grade B 2, 13 aside For ( Teams who are strong but do not have enough numbers to compete at B 1 @ 15 aside ) NOTE: Change from 12 aside to ..
Rebel Og Coaching have a busy few weeks ahead of them both on the field and in a classroom setting.Workshops with Dr. Wesley O Brien will take place in both Clonakilty and North Mon AG on Monday and Wednesday next. Over the last 8 weeks there has been football squads sessions taking place. On Sunday next, it will be the turn of the hurling squads. 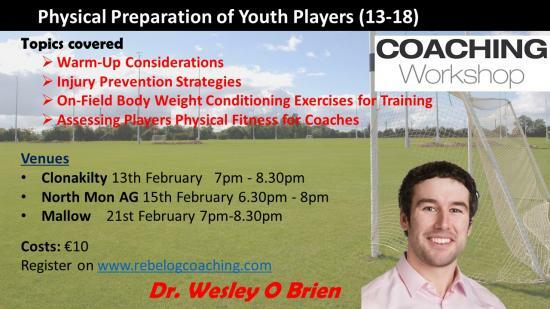 Rebel Og Coaching will run some mid-term camps on the 20th followed by County Squads having their first session of 2017 on Wednesday 21st.&n..
For the month of February, Rebel Og Coaching will be running a number of Award 1 and Foundation Level Coaching courses. Below are list of dates and venues that these clubs are running Award 1 & Foundation Courses, please bear in mind that these courses are being run by the clubs listed and if there are places available you may take part, but please contact the club secretary first.Award 1 CoursesKilara Og – Feb 7th 11th 14th & 18thCarrigtwohill – Feb 20th 23rd 27th &..
As a reward for all clubs who completed the Benchmarking 2020 Gold, Silver & Bronze Award and submitted their application for 2016, Rebel Og Coaching and Games will hold a conference with three speakers on the day who will address key areas of development and provide ideas and solutions for clubs to help run a fluent Juvenile GAA club.Please note- this event is a closed event and only open to clubs who were awarded with Rebel Og Coaching Award in late December. 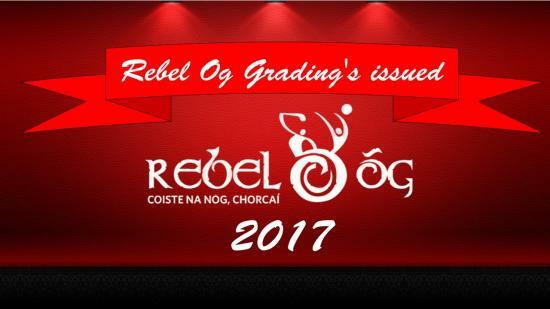 Registration ..
On Thursday morning, Rebel Og Grading Committee published the 2017 Final grading's for the year ahead. The grading committee have been working independently to the boards over the last number of weeks. This final publication brings the work of the grading committee for 2017 to an end. Rebel Og would like to thank the committee for their work. 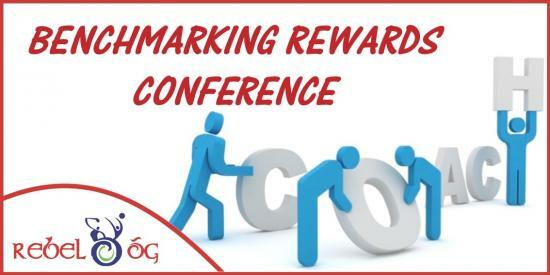 The grading's were emailed to all club secretaries email accounts. 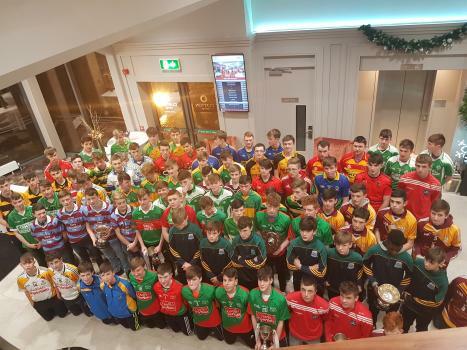 A copy of the grading's can be found here Final G..
On Saturday night last, the 2016 Rebel Og Awards Banquet took place in Clayton Hotel Sliversprings under the watchful eye of Joe Kennedy General Manager and Seamus Healy Conference Manager. The evening was hosted by Lisa Lawlor and Colm O'Connor who acted as MC's for the night. With guest of honour Rob Hefferan Joe Kennedy opened the evening and welcomed all the clubs to the hotel. 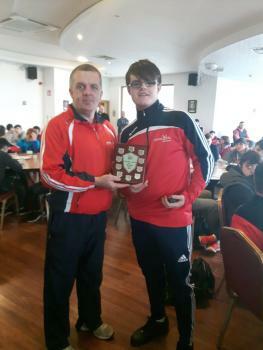 He thanked Rebel Og for their support during the year and is looking forward to working with the ..
On Thursday evening in Clayton Sliversprings, Rebel Og held the presentation of the 2016 County A, B and C winners titles. 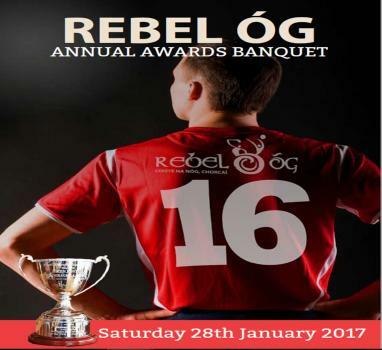 The annual event, is a very informal occasion when Rebel Og invite the winning teams to join them in celebrating the success of 2016. The night was opened by Rebel Og PRO Cian O'Brien who acted as MC for the event. Rebel Og Chairman John Purcell thanked all the clubs present for their help and co-operation for year gone by. In all Rebel Og County section r..
RebelÓg Roll of Honour 2016 Adrigole;U16C County Football ChampionshipAghabullogue;Minor B County Football Championship and League Aghada;U15B County Football ChampionshipBallincollig; U14 Premier 2 Football Championship,U15 Premier 2 Hurling League, Minor Premier 2 Hurling LeagueBallygiblin/Mitchelstown; Minor A County Hurling Championship, Minor Premier 2 Football League and Championship Bandon;U14ACounty Hurling ChampionshipBéal &Aacut..